WHYNOT – Clyde J., 91, of Liverpool, passed away peacefully at Queens General Hospital on Sunday, January 31st, 2010. Born in Liverpool, he was a son of the late James and Florence (Harnish) Whynot. 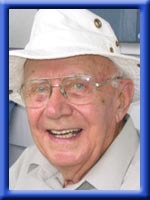 Clyde was a veteran of the Second World War, serving overseas with the R.C.A.C.E.. Following the war, he worked as a carpenter doing renovations and home construction throughout Queens County before beginning a small window making business. In 1957 he opened his own woodworking business in Sandy Cove known as Whynot Woodworkers. Over the years this business experienced several renovations and expansions. Upon his retirement in 1983 this was still a thriving business in Queens County. He had many interests and enjoyed regular canasta games with friends, playing pool, square dancing, curling, time spent at the Hollow Log Rifle and Pistol Club, helping his children with home renovations and taking long walks. He is survived by his loving wife of 64 years, Frances. His daughters Linda (Lyman) Oickle of Milton, Kathryn (Neil) Richter of Middle Sackville, Iris (Ken) Cuddy of Perth, ON. Grandchildren Lisa (Darren) Williams, Blair (Kim) Oickle, Krista (Nathan) Orman, Troy and Kevin Richter, Jonathan and David Cuddy. Great grandchildren Gregory and Jennifer Williams and Sarah Oickle. He was predeceased by his sisters Pearl Soper and Kathleen (More) Grosvenor and brother John. To the Whynot family: We are saddened to hear of the passing of Clyde. He was a gentle loving man and we know he will be missed by you all. Francis and family,we were so very sorry to hear of Clyde’s passing.Please know that our thoughts and prayers are with you. We Are So Sorry To Hear Of The Passing On Of Clyde. Francis Will Surely Miss His Little Talks With Him When We Went For Our Walks Down Town And We met The Two Of You. If There’s Anything We Can Do To Help You & Your Family Please Don’t Esitate To Call. Frances,Linda,Kathryn,Iris and famalies.Very sorry to hear of Clydes passing.Our thoghts are with you. We are so sad to hear of Clyde’s passing. Since moving to town we so enjoyed seeing him on his walks , such a lovely gentle man and I so remember the Love he had for his wonderful family spending time as a young girl in your home. He will be with you all forever in your memories and hearts as well in the hearts of all of us who were blessed to have known him. Please find strengh at this very sad time in knowing so many care . To Francis and Family: So sorry to hear Clyde passed away. He was a kind and very well thought of man, we will miss seeing him on our walks. God bless you all. We are so sorry to hear of Clydes passing. He was such a nice and caring man. I enjoyed working with Clyde all those years ago when I worked at Whynots. Please know that our thoughts and prayers are with you and your Family. sorry to hear about clyde, we are deeply sadden. our prayers are with you and your family. sorry to hear about the passing of clyde. we used to see him walking when it was fine days in the summer. our thoughts are always with you. Our deepest sympathy to Frances, Linda, Kathryn & Iris and their families on the passing of your loved one. We remember Clyde as a very quiet, gentle loving person and he will be sadly missed. May your memories of him stay forever in your hearts. So sorry to hear of the passing of Clyde, he was a wonderful gentleman and will be missed by all who knew him. Clyde’s was a life well lived. May your memories sustain you through these difficult days. Be strong, Frances. So sorry to hear of Clyde’s passing. Our deepest sympathy to you and your families at this difficult time. You are in our thoughts and prayers. So sorry to hear of Clyde’s passing. We are thinking of you at this most difficult time. Treasure all the memories that you have. Sorry to hear of Clyde’s passing. Our thoughts are with you at this most difficult time. Cherish all the memories. We were so sorry to hear of the the passing of your dear father. He will be sadly missed in the community. Dear Frances and family: My sincere condolences on the passing of your dear husband and father. He will be missed by all who knew him. My thoughts and prayers are with you at this sad time. We were very sorry to hear of your father’s passing. I am sorry to hear about your loss. I miss going for a walk and talking to him. He was good man. My thoughts are with you. Sorry to hear about your loss. He was a great guy. I miss talking to him when I went for a walk. My thoughts are with you. So very sorry to hear of Clyde’s passing. He was a wonderful man full of smiles and fun! Will always remember the many games of canasta enjoyed with you both over the years. Our thoughts are with you during this difficult time! We sure miss the canasta games and socializing.